Are you are a local of Croydon Melbourne Australia? Then you most probably have seen Wayne on the street. 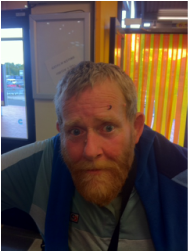 Wayne has hung around the streets of Croydon for some time and is considered a well known local, though he was not that well received, being a homeless straggler. One day Wayne wandered into Gregs pizza shop and asked for a little money. Greg being Greg, gave him a few dollars. The next day Wayne once again turned up asking for money. Greg knew at that moment Wayne was sincere. He was hungry, dirty, and 80% blind, he had open sores that oosed out of his head, It looked like Wayne had been in a fight. But Greg soon learned Wayne was no fighter, those sores were the result of falling, bumping into things, as Wayne was 80% blind and just needed treatment. Greg swung into action and invited Wayne to take a seat. He asked him to choose a large pizza of the menu, as well as a drink from the fridge. Greg decided Wayne was to be treated as a special guest and typically treats his customers with the same respect. Wayne eagerly ordered a large pizza with the lot and a can of coke. With a renewed but shaky dignity, he sat silently waiting to be served. This was an overwhelming personal experience for Wayne, as he was not used to this kind of treatment. Little did Greg know that this was the beginning of a challenging but rewarding friendship. Ten minutes later he bounced out of the kitchen and placed Wayne's large pizza with the lot in front of him. Then from a little distance he watched as Wayne simply sat staring at the pizza. For a few moments Wayne sat completely overwhelmed by Greg's generosity, but soon enough he got stuck into that pizza and downed his coke. Then something completely unexpected happened that Greg will never forget. While he was in the back of the kitchen, he heard the tingling of coins coming from the tip jar. His first thought was, Wayne was stealing his tips. He ran round to the front counter and to his amazement, there was Wayne, emptying his entire purse, emptying all the coins he had into the tip jar. To Greg this was to be a defining moment in his life experience. Here was one of the poorest of the poor in Croydon, giving all he had into his tip jar. It was only a few small coins, but it was everything that Wayne had. Wow what an emotional moment? Greg decided right then that whenever Wayne was hungry or thirsty he is welcome to have whatever he wanted free no charge and that everyone in Croydon needs to hear this local Croydon story. From that day onwards, Wayne showed up virtually everyday. Yes and of course Wayne did expect to have a pizza and coke, and it was always available. This journey was quite a challenge for Greg. The Center Management security had often removed Wayne from the center, and Greg was getting an earful from other disgruntled shop owners as they did not want Wayne hanging round. However, Greg had big plans for Wayne. Over the next 12 months Greg gave Wayne some odd jobs. He collected trollies, though he was slow, he always tried his best. Over a year later, Greg continues to support Wayne with food and a little money, but only on the condition that he cleaned himself up and stoped begging in the center. Today Wayne is a different man, he has become more resourceful. He has cleaned up his appearance, he is clean shaven and lives in a homeless shelter. Today you will find Wayne on the streets of Croydon, not begging or living out of garbage bins. He is actually giving out little key chain hearts, raising funds to support a young Autistic girl named Jasmine, who you will hear more of in our next story. So if you come across Wayne, please don't discourage him. If you can spare a few dollars as a donation, then grab yourself one of those special hearts. Wayne has turned out to be the very first volunteer in Greg's mission, to change the heart of Croydon. Wayne has certainly stepped up to the plate and set a great example, and in his own way has become a difference maker. Greg now understands that Wayne was born with a mental disability. He suffers from severe short term memory loss, and is virtually blind. He is probably on his last legs. He rarely recognizes anyone, people are just fuzzy images, but he always recognizes Greg's big beaming voice. Sadly a few weeks ago Wayne was robbed while playing his part. As heart breaking as that was for Wayne, it did not stop him. Wayne is still out there, but he is now a little afraid to sell his hearts and could do with your encouragement. Greg is totally committed to Wayne, and imports the hearts. Wayne gets 50% of whatever donations he receives. The remaining 50% goes to support an 11 year old Autistic girl called Jasmine, who actually came up with the idea of encouraging homeless people to stop begging and to give out gift hearts to collect donations. Jasmine began this idea at 4 years of age and believes our world needs more heart. Greg does not make a cent out of those hearts, and does not even take out his cost. He sees it as part of his duty once again to support those in greater need. I hope you enjoyed this simple but powerful local Croydon story. Make sure you come back to this page, as we will be sharing more stories about other volunteers who need to be recognized. 30 a day when we were waiting for the supply of hearts for Wayne. in his quest to make changes in his future. GIVING IS LIVING. Hi to all my mates! I just want to thank Shayne for writing the story about my mate Wayne, and also to all the people in Croydon who have supported Wayne in his day to day struggle with life. Over the past year Wayne has given out over 2,000 hearts and is still turning up in the community of Croydon. His life has taken a turn for the better. It’s all thanks to a little girl with the biggest heart and a loving father, who shared a story about his daughter, Jasmine. The first time I met Jasmine she bounced up to me with a big smile and said, “Love each day with a happy heart.” I thought to myself, this girl is full of love. You don’t see that everyday. That quickly grabbed my attention to learn more about Jasmine. Her father began to tell me Jasmine’s story. He recalled his first experience when Jasmine was only four. He told me Jasmine burst into his office, jumping up and down, all excited saying, “Daddy, Daddy! Can you take me to the shops, please?” When her father asked why, Jasmine replied, “I’ll show you when we get there.” So he got his keys and headed for the car. He turned back to see Jasmine holding a bag. when she was asked about the bag, she replied, I’ll show you when we get to the shops, Daddy. This puzzled her dad a bit as he had never before seen her behave in this way. That was the beginning of a life-long fascination Jasmine has had for hearts. At the age of eight, Jasmine and her mum came up with the idea of selling hearts for two dollars. Jasmine would set up her little stall and to her dad’s surprise they really began to sell. While under the watchful eye of her Dad, she just wanted to go out to businesses and sell hearts, with all the confidence in the world. Jasmine began to share some of her profits with a local church in Frankston which was working with homeless people. It was then that Jasmine had an idea. She thought that maybe homeless people could stop begging and start giving hearts out and receive donations. It worked, and for nearly 6 months a number of homeless people began to go out and sell her hearts. It became quite an event in Frankston at the time. At the age of ten, Jasmine was diagnosed with severe Autism. It is high functioning Autism. Because she is home schooled and surrounded by loving support from her parents, she is well adjusted to life. It is refreshing to see her attitude to the challenges life has put in her path. She doesn’t know she has any issues. Like the bumble bee, which doesn’t know that aerodynamically it can’t fly, Jasmine just gets on with living a fragrant life. It is amazing to watch Jasmine go out and sell hearts in cafes and businesses in Melbourne. Jasmine prompted me to see if Wayne would sell hearts. When I asked him, he refused as he had never done anything like that before. So with a little encouragement I gave him one heart and said, “You know the lady in the Chinese Takeaway, Wayne? Go and see if she would buy a heart from you.” With fear in his eyes, he agreed to give it a try. A couple of minutes went by and Wayne returned like an excited child. “She bought it! She bought it!” as tears rolled down his face. He said to me “That’s the first time I’ve made money in thirty years!” I gave him a big hug and said, “Well done Wayne.” Isn’t amazing what can go on in a little pizza shop. Thanks for taking time to read this inspiring story, and as I said in the beginning, thanks for supporting Wayne and Jasmine.